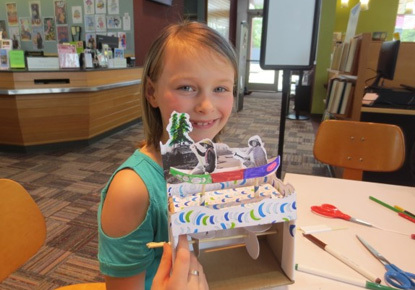 Monday, June 18, 2018, 4 – 7 p.m.
Be inspired by the past and present stories of people who care for this amazing river by making fun and playful cardboard mechanical toys. Makers will be able to understand simple mechanisms by building cardboard automata, exploring levers, cams, and other mechanisms, as a means to make their mechanical toy work. Presented by Makers of South Seattle. For ages 8 and up. LibraryLab (formerly Tinkerlab) is a time for people of all ages to experiment, play and create amazing inventions. We have guided sessions as well as drop-in times when you can create at your own pace, using materials we provide.